a little hollow, as the socket of a tooth, a follicle of an acinous gland, or a pulmonary alveolus. adj., adj alve´olar. dental alveoli the cavities or sockets of either jaw, in which the roots of the teeth are embedded. 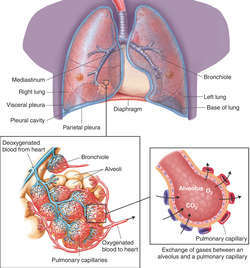 pulmonary alveoli small outpouchings along the walls of the alveolar sacs and alveolar ducts; through them, gas exchange takes place between alveolar gas and pulmonary capillary blood. 2. The bony socket of a tooth. 4. Any of the honeycombed depressions of the gastric mucous membrane. 5. A follicle of a racemose gland. Glandular structures arranged in clusters throughout the breast and the site of milk synthesis. Small air sacs or cavities in the lung that give the tissue a honeycomb appearance and expand its surface area for the exchange of oxygen and carbon dioxide. Unification at the cortical alveoli structure were detected at follicles (Fig. Cortical alveoli in oocytes of freshwater neotropical teleost fish. The histopathology revealed lung tissue exhibiting variable sized lung alveoli containing amorphous eosinophilic material. In males, the alveoli are in regression, they have many phagocytic cells among the residual sperm. Elastin provides elastic recoil in the lungs; losing elastin means the alveoli do not deflate and cannot expel respiratory gases during exhalation. The volume of the cryobiopsies was significantly larger and the number of alveoli was significantly greater when compared to conventional biopsies (P < . Transbronchial Cryobiopsies in the Evaluation of Lung Allografts: Do the Benefits Outweigh the Risks? These authors evaluated the natural healing of alveoli without implanting any type of biomaterial. From the centre of such a bronchiole, a perpendicular was dropped to the edge of the Acinus (Connective tissue septum or pleura), and the number of alveoli cut by this line was then counted. As such, the walls of the alveoli need to be healthy and elastic. Alveolar diameter (short and long), number of alveoli and alveolar cell population were significantly (P Less than 0. Histopathological findings revealed significantly lower alveolar diameter, number of alveoli and alveolar epithelial cell population in mastitic dairy cattle. Finally, the fourth stage involves the formation of alveoli.